India’s two national bourses plan to sell stakes in their depository arms, which together account for 22 million investor accounts and demat assets worth Rs 121 lakh crore. National Stock Exchange (NSE) is in talks with institutional investors for unloading its stake. The BSE plans an Initial Public Offer (IPO). The transactions are required to meet a three-year deadline, ending 2015, to reduce stake. An NSE spokesperson confirmed that talks with potential investors in National Securities Depository Ltd (NSDL) were on but declined to provide details. BSE declined to comment on plans for its subsidiary, Central Depository Services (India) Ltd. However, the bourse has informed shareholders that it is working on an IPO. “Subject to the approval of Sebi (Securities and Exchange Board of India), your company proposes to list its securities on any recognised stock exchange other than its sponsor exchange. This will provide an exit route to the majority of shareholder/s who want to exit or offload part of their holding by way of offer for sale. However the holding of all sponsors taken together at all times shall not be less than 51 per cent of the total share capital of the company,” the CDSL annual report stated. Both exchanges are required to bring their shareholding down to 24 per cent, as decided by the regulator following a board meeting in April 2012. “In the case of depositories, a minimum 51 per cent will be held by sponsors and the existing list of sponsors will continue. No other entity will be allowed to hold more than five per cent of equity share capital. A single stock exchange will, however, not hold more than 24 per cent,” Sebi had said. BSE held 55.16 per cent in CDSL at the end of 2013-14. Banks held another 44.84 per cent. The shareholders include Bank of India, Bank of Baroda, State Bank of India and HDFC Bank. 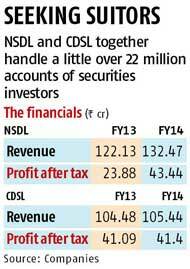 CDSL had profit after tax of Rs 41.4 crore in that financial year. NSE held 25.04 per cent in NSDL. The shareholders include IDBI, Deutsche Bank, Axis Bank and State Bank of India. NSDL had a net profit after tax of Rs 43.4 crore, according to its website. Any stake sale in the current market environment is likely to be received well, says Darshana Kadakia, partner, valuations, Grant Thornton India LLP. “Considering the upbeat market sentiment, investors’ interest in the depositories is likely to be very high…The performance of the depository being directly linked to the activities on the stock exchanges, with a vibrant and dynamic stock exchange, the performance of these depositories is poised for high growth. This might lead to good valuations for the stock exchanges,” she said. Depositories, she added, typically have a loyal customer base and are generally averse to changing depository service providers. “Given this situation, there might not be a shift in customer base even if shareholdings in the depository change hands,” she said.